On Friday, the leader of North Korea crossed into South Korea for the first time in 65 years. The two leaders agreed to try and create peace between the two Koreas. The leaders of North Korea and South Korea agreed to try and bring peace to their countries. The Korean war, which started in 1950, never officially ended. The two sides, and the countries that were helping them, simply agreed to stop fighting. They did not reach a peace agreement. The United States, which helped South Korea in the war, still has tens of thousands of soldiers in South Korea. The border between North Korea and South Korea has more weapons and soldiers than almost any other border between countries. 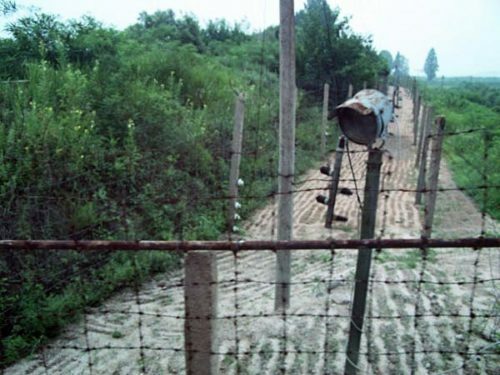 The countries are protected from each other by barbed wire, electric fences, and even mines (bombs in the ground). In some places the countries have been playing music or speeches toward the other country at a very, very loud volume. The countries are protected from each other by barbed wire and electric fences. On Friday, Kim Jong Un, the leader of North Korea, shook hands with President Moon Jae In of South Korea, and stepped across the border. Nothing like this has happened since the two sides stopped fighting. The two men, and others, met for hours and talked about ways to solve some of the problems between the countries. The meeting was held in Panmunjom, a village between the two countries. South Korean president Moon Jae In and Kim Jong Un, the leader of North Korea, step across the border between the two countries. Mr. Moon of South Korea reported that Mr. Kim agreed to several ideas that South Korea and other countries had hoped for. Mr. Kim agreed to get rid of his country’s nuclear weapons if the US promises not to invade North Korea. Both sides said they want to officially end the Korean war by the end of 2018. They also agreed to stop playing music and speeches across the border. Mr. Kim and Mr. Moon now have a special telephone line, and they plan to speak often. Later this year, Mr. Moon will visit North Korea. The countries will also look for other ways for the people of their countries to get together, like they did during the winter Olympics earlier this year. Mr. Kim said North Korea would change its time zone so that the time in North Korea will be the same as it is in South Korea. 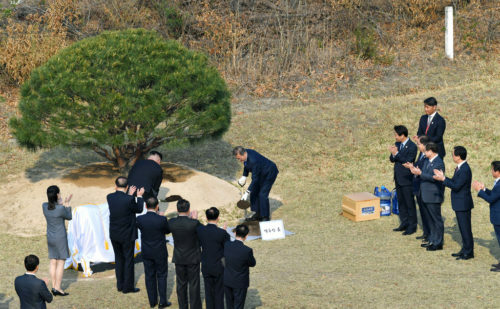 The two leaders planted a tree as a symbol of peace. Even though the meeting seems to have had good results, some people are not sure that North Korea will do what it says. They point out that North Korea did not give details about how it would stop working with nuclear weapons. The US and North Korea are still trying to work out a plan for Mr. Kim to meet with US president Donald Trump. That meeting could happen in May or June. Some people are worried that Mr. Trump may slow down some of the progress that the countries seem to be making. On Tuesday, the country of Macedonia officially changed its name to North Macedonia. The change seems small, but it solves a problem that has been going on for almost 30 years. December 10th is Human Rights Day. 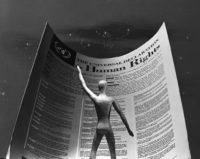 This year, the day marked 70 years since the nations of the world agreed to set out, for the first time, a list of rights belonging to everyone in the world.